Online Skill Schedule for all courses. Contact Andrea or Alyse for more information. New courses start the 1st and the 15th of each month. 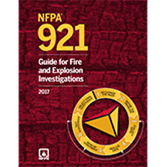 The NFPA 921 2017 book will move from our required textbook to a recommended textbook. 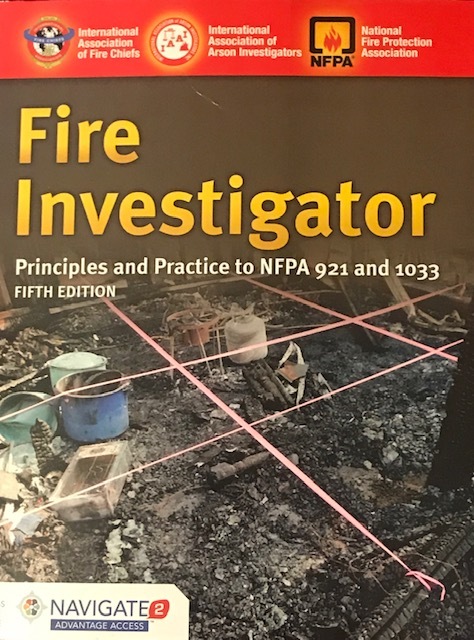 This is a good book to have and it would be suggested to get if you are going to be actively conducting Fire / Arson Investigations. NFPA 921 2017 ed. Click image to go to nfpa to order. Fire Investigator training is very difficult to both locate and successfully complete. The Texas Commission on Fire Protection recommends a curriculum of 150 hours in order to be eligible to take the state examination for certification. Upon successful completion of our Fire Investigator program and the state examination, the student will be eligible for not only receipt of certification in the State of Texas as a Basic Fire Investigator, but also eligible for an IFSAC seal as Fire Investigator. Students do not need the Navigate 2 Access for this course. We will come to you! : With a minimum enrollment, a Fire In Texas instructor will come to your facility, in your fire station, in your city to provide this on-site training. Not only will we come to you, we will allow you to select the option of how you would like to receive the training. Some departments perfer to run the program back to back for the three weeks necessary to complete the training. Some departments would rather receive half of the training and then complete the other half next month. We have had departments that wished to receive one week of training each month over a three month period. In this manner the students are exposed to a large block of material but then have several weeks to review that material and prepare for the upcoming block. Another exciting new option available that many Fire Chiefs find very refreshing is a combination of the on-site and on-line formats. Many Chiefs and individuals also are apprehensive about taking a course on-line totally. In our exciting new format, initially our instructors come to you and conduct on-site training exactly the way an entire on-site course would be offered. However, in this case after all the questions are answered, after a few chapters have been presented, after the course settles into a good learning pattern, the course shifts over to an on-line format. While our instructors are available 24/7 for questions, problems are any issues that may arise, the students receive the training from their homes, fire stations, or where ever they happen to be. Then, on a predesignated date, our instructor comes back to your facility to hold on-site classes for the last few days of the course. During this time the material is reviewed, required skills are conducted, and the students are prepared for the upcoming State Examination. Many Chiefs like this concept due to the fact that they receive the benefit of the on-site class at the beginning and end of the course, yet during the center section the students do not have to come in on their days off compiling overtime hours to receive the training. Contact Fire In Texas for pricing and course requirements. On-Line Training: Our training training are approved by the Texas Commission for on-line presentation. If the student would like to receive the certification presentation from the comfort of your home or fire station this is the way to go. There is no minimum number of students. Each student enters the program, works at their own pace, and upon successful completion of the academic portion of the course schedules and attends a one-day skills session where the student demonstrates mastery of the subject matter and associated skills. The option is YOURS!!!! Regardless of which option a Fire Chief, Firefighter, or individual may select, isn't it refreshing to receive quality certification level instruction in your own city without having to travel hours away with someone else setting the dates for the class. Think of the budget monies that will be saved due to less travel expenses, no overtime expenses to cover for personnel out of pocket due to attending out of town training, and the comfort of sleeping in your own bed at night rather than at some hotel in a far away city. At the conclusion of either option, Fire In Texas awards a Certificate of Achievement to the student verifying that the course objectives and standards have been completed. In addition a Certificate of Completion is presented to the student which the student sends to the Commission on Fire Protection to set up their state examination. Financial Aid? Are you a Volunteer Firefighter or a member of a paid department that has less than 20 paid staff members? Fire In Texas courses are eligible for grants under HB 2604, which is administered by the Texas Forest Service. Contact us or the Texas Forest Service at 979 458-6505 to see if you or your department qualify for full or partial tuition reimbursement. *Additional fees may apply for skills not completed at our training facility. Contact dedee@fireintexas.com for more information.